Helping you return from the breaking point! The world of outsourcing is fast becoming a force to be reckoned with. It was for a long time one of those frowned upon topics, almost a dirty word. But slowly over the last 5-8yrs, this has changed and has changed for the better. I think the main reason for this is the boom in small businesses, more people are realising their dream of being their own boss is in fact easily achievable, and the desire to do well is fuelling this passion too. And with the influx of small businesses, the need for support has grown too, slowly people are realising they don’t have to hire someone full or part time anymore, and you don’t have to reach for the employment agencies number either, as those alternatives are costly, more so to a small but growing business. People have realised that there are an alternative and one that will work hand in hand with you and your business needs, a solution that keeps you in control but frees up that time you are losing carrying out the tasks you don’t need to do. Reassurance – This is a biggie, a lot of clients that I have now said that when they started to plan the concept of working with a VA, they were filled with fear, for having to hand over work that they and ploughed time into or a project they have put together, or built that connection up, and fearing that handing it over to someone else is daunting. So for me, it’s always been a subtle and slow process, I would rather you handed over one or two small things a month to gain that trust and make sure that everything I am doing is to your 100% satisfaction, then and only then we can start working on other tasks. This is all about working at a pace you are happy with. 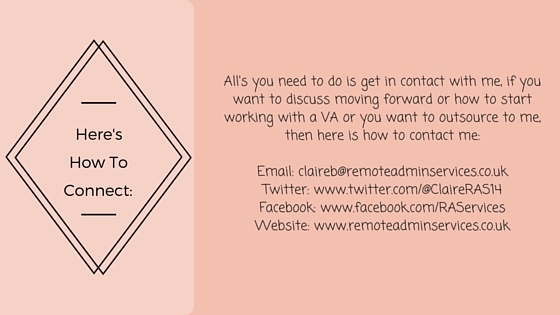 Guidance – A lot of people who start working with a VA are new to this way of working, so things won’t always come naturally to them, so for me it’s a case of making sure you have every bit of guidance you need, I will make sure that we have file sharing capabilities set up, with instructions, I will make sure I guide you through giving me permission to work on certain systems, and each step will be in line with your instructions. Communication – This goes without saying, communication is vital in making the business relationship work, I will make sure that you get an update on tasks that I am doing for you on a weekly basis, this will mostly be via email, but we will always have ‘kick-off’ calls (skype/messenger/Google whichever is your preference) at the start of any new task you ask me to do, this is where we will go through the basic information and any visuals you may need me to have. I will keep you up to date times for the month. 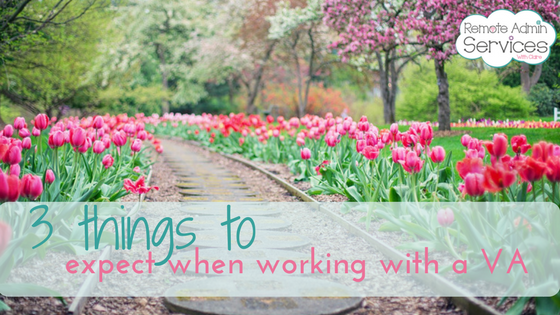 These to me are 3 of the key things you should expect when working with a VA, of course, there is more, but these were the ones I felt needed explaining that they are a given! Being a business owner is great, I love it, it is so rewarding, I work around my little family, get to do the school engagements, homework and make memories with them. So, hands up all those that have fun trying to fit everything into their working day! Yep ME, I sometimes open my diary on Monday and think ‘What the heck’ and I can feel myself going into overdrive, but we need to remember we are human! We can only do what we can with the time we have. I have found some useful hacks to get me through those hectic weeks. See I am a tech loving gal, but I do adore my stationary, a little apt as its National Stationary week this week, (it really is a thing check it out HERE), I do love writing things down, and trust me I have written down notes, keywords for this blog that you are reading now, before I drafted it and posted it to my website. No matter how much I try to move everything to electronic, my inner child just loves going into a stationary shop and buying lush books, pens and other amazing bits and bobs for my desk. Block out any long-standing commitments, I have 2 of these in my working week, and they are blocked out on my electronic diary and my desk diary every week, so I know that Tuesday 9.30-11.00 and Thursday 9.30-11.30 each week are blocked out regardless, I know I cannot book anything in during those times. So I work my other tasks around those times. I also know that I have the school run to do so that is blocked out. Highlight ‘DFT’ Distraction Free Time, this is the time when all pings, dings and notifications are banished, use this time for when you NEED to have your head down with NO distractions, so turn off your phone, don’t open certain apps and programs. Imagine you are heading into a cave lol – I wrote about it HERE in a previous blog. Colour coding, for me each of my clients has a colour code, this way it’s easy to see in my diary, who is blocked in where and when, but equally my business has a colour too, and I make sure that I give myself equal time to market and promote my business, as well as my own admin/finances etc. Use systems to optimise your productivity, I use Trello and Canva, both are incredible in their own right, Trello is my go to program that holds all my social media content past and future, ideas, helpful information like Hashtags, advertising rules for Facebook groups etc, and Canva helps me create amazing images and Memes in a heartbeat. Timer, I work with a timer, not only for my client work but for me too, I have noticed that as soon as I click on that go button, my procrastination waivers a little and find I am more productive knowing my timer is going. Before I used this I would happily waste time on what I thought was useful but turns out I was unproductive to my business. Visible clock, again I have mentioned this before, you need to have a visible clock in your office, you need to be aware of the time you have left on that particular day, and if a task is taking too long, then schedule it for first thing the following day, give yourself a break from it. I have noticed since having a clock in my office I am more aware of my day, crazy I know but for me, it has really worked. Set an alarm, remember you are not a 24/7 business, you have to eat, sleep, relax and do things you enjoy, you need to remember those office hours, if you do not have office/working hours in place, I urge you to set some this week. And make sure you stick to it. Can you imagine being in your old employed job and your boss tells you that you never log off!!! These are just a few small hacks I have found very useful to my business, I hope they help you if you have any of your own do share them with us. Are you a habit creature? We have all read those articles where they tell you ‘wake up at 5 am to become a millionaire’ or ‘drink a green smoothie to become successful’ – I think I have at least one of these articles in my inbox each week, telling me what I need to be doing to become a successful business owner. Now I can tell you I DO NOT get up at 5 am, that to me is still the middle of the night, and I personally don’t like anything green to eat or drink so a green smoothie will never pass my lips. Ok I can tell you now I am not a millionaire nor would I say I was hugely successful (yet!). What I can tell you, is, my business is producing a wage and I am comfortable. I personally don’t think these lists of what you should do, will benefit you in that way, I think you need to read them with a pinch of salt and to use them to perfect your routines, to make you more productive and focused. I think it is great to read these articles and ones alike to see if anything they do could fit into your lifestyle and business routine if it doesn’t then move on. I believe in normal ‘Sleep and Food’ – I feel eating and sleeping better does improve your productivity levels, whether this will, in turn, you into a millionaire who knows! We all know that when you was based in an office that Friday afternoon slump would kick in about an hour after you and your work colleagues got back from the pub, you know after that massive burger and chips you ate! I know from experience that massive lunch would turn me into the most UNPRODUCTIVE person ever. I also feel that a healthy balance of exercise will help you towards a more productive week. Mixing that with your sleep and food, you should see a massive difference to your attention span during the week. But none of these things I don’t feel will make you more successful nor do I think will make you a millionaire, these will help you to move forward and become the best you can be, and if that means it helps you create more business, then great, but I do wish these gurus would stop telling us these quick and sure-fire habits will fast track you to success. You are the reason you are successful, you are the reason your clients what to work with you, not because you have a green smoothie on your desk! To be honest, if you eat healthily, you exercise regularly, and sleep well you should see huge results in your productivity, use that to your advantage if you find you have more umpfh then use it to benefit you and the business. So don’t be fooled with all the habits and routines that famous business owners are doing, as that works for them, remember running a business is not a one size fits all. You need to find the routine and habit that works for you and your business. Hey everyone, in my last blog I mentioned to you above trying to find your self-discipline, how has that gone? It can be a tricky one to grab hold of and run with, because of so many distractions, I also gave you some tips on how to cope and deal with those distractions. I want to talk to you about the importance of staying in touch with your crowd, we all know we can stay in touch via Social Media, but sometimes it’s just not enough is it. I have got into a good routine of keeping a check on my insights on my social platforms, I post at various times, some when my crowd are online and other times when they are not active, most of my crowd are online late afternoon/early evening, I do schedule posts for that time, but I do like to do things in real-time too. In March’s newsletter, I spoke about the amazing competition that I won back in October 2016, which was run by the A.M.A.Z.I.N.G Emma Holmes of Coaching Rockstars. I had seen her posts on social media and a few friends through business had shared her post too, but still, didn’t feel compelled to enter it as I felt I wasn’t lucky enough. Then I had a Rockstar newsletter hit my inbox which went into more detail, with all the relevant links, it just spoke to me, I felt it resonated with me and the situation I was in at the time, it was that email just pushed me into entering, and how glad am I that I did! I have managed to spend time with some AWESOME, inspiring, knowledgeable women in the industry. 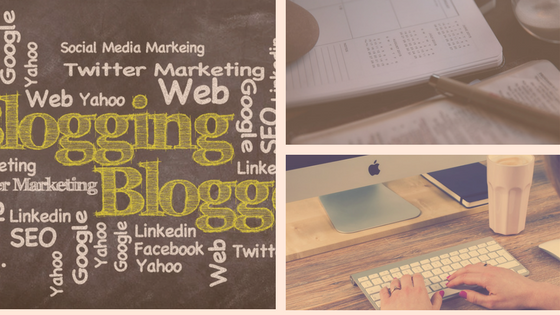 The power of e-marketing is huge and can have such an amazing effect on your business. You can reach out to your crowd with a push of a button, you know it will land in their inbox when you ask it too, and it will be filled with great content, you can get your message over in more depth, as on social platforms you don’t want to flood your crowds timelines nor make it too long. This way you can create that eye-catching content. I think how Emma ran her competition and made sure it landed in the right hands was amazing, she clearly knows her crowd and she knows how to make you feel that she is reading your mind. This IS something you can learn over time, but you need to start somewhere, so being in touch with your crowd regularly via a newsletter is key. You can grow your list with sign-up boxes and links to freebies, these are things I will be talking about in future blogs and newsletters. Over the last few weeks on my page we have celebrated International Women’s Day, it’s a powerful day, and one that should be celebrated. Also, I shared a video from Eric Thomas who claims there is no such thing as procrastination, he says people get it confused with something that is of no interest to you, so in turn have no desire to do the task, what do you think? Why wait? I asked my followers why wait for that business to find you, sitting in your office behind the PC isn’t going to pay the bills, you have to be active looking for business, you need to get yourself out there, be bold, be bright, be seen (I’m sure that’s a tagline for crossing the road!) 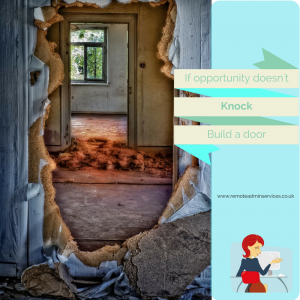 If opportunity isn’t knocking then build a door! What do you do? do you go networking, or have another avenue you go down to generate leads and business? share with us what you do. If you have anything you need help with or want me to discuss then leave me a comment, I have a huge list of thigs that I want to share with you over time, so do let me know as I could be doing a series that could benefit you. 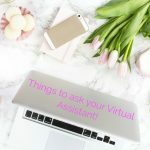 Don’t forget I have my freebie – What to ask your Virtual Assistant, I created this to help those that are hoping to hire a VA in the near future or maybe changing to a new one, its just a small guide to help you. If you are struggling to stay on top of things and wondering if outsourcing is the way forward for you and your business, I am happy to have a chat with you to help you decide. It suits some but not all. Logging Off…….You can do it honest! I don’t know about you, but when it gets to a certain time of day I seem to struggle to log off, ever since launching my business and I became a small business owner, I constantly feel compelled to stay logged on and producing more work, more Facebook posts, more tweets, more memes, just more in general. But when is enough really enough? As I have mentioned in previous blogs, I had to get strict with myself purely for my own sanity. There I was constantly telling you all to free up some time and have quality time with your loved ones or even do your hobby, and there I was still logged on churning out work. So, when I felt slightly burnt out Mr RAS put his foot down and reminded me that I started this business to firstly to fit around our small family, followed on by helping fellow business owners take control of their time, and help them with their tasks, and he was right, burning myself out wasn’t helping anyone, least of all myself, as I was creating a monster that was going to implode one day. So, I sat there and redrew my plans for the business and for the family, and not surprising my family came up first, which I think I would have been surprised if they hadn’t. But I had a massive shake up, I set myself proper working hours, and a dedicated late night for online networking and that’s it! This has been in full swing now for a few months, things have gotten a little easier now both of my children are in full-time school, so a lot of client work is getting done during my office hours and not when the children have gone to bed, don’t get me wrong, if one of my clients comes to me in a real bother and urgently needed help, then of course I will try my hardest to help them out of that hole they are in. You owe it to yourself, and your growing business to be firm with your expectation, I bet when you was employed in the corporate world, come 5.30pm you was out that door queuing to get out of the car park, so why are you still sat there at 8-9pm at night working! And I bet you have even taken your laptop to the family room to work, to make it feel like you’re still part of the family! And then you wonder why your body feels like you have gone 10 rounds with Tyson! Now is the time for tough love! Sit down and set realistic working hours, I have set mine as 9.30-3.00 then 6-6.30 (finishing off any rogue tasks) and one late night on a Tuesday for online networking. Plan your week, this needs to be done on one of 3 days, either Friday afternoon before you log off for the weekend and finalise the week you have had, or Sunday afternoon fresh from the weekend, fresh eyes, fresh mind or first thing Monday morning before you check anything else and get waylaid by any other tasks. Personally, I prefer Friday afternoon or Sunday afternoon, there are fewer chances of me getting distracted. Schedule, there are loads of free tools out there for you to use in order to schedule your posts/tweets etc, I personally use the free version of Hootsuite – with this I can schedule in my post for Facebook (I have my business page linked to it) I can also schedule my tweets, I have my Google+ and LinkedIn accounts connected to my Hootsuite. I recommend to try and schedule in around 2 posts a day on Facebook, and one on other platforms, Twitter is different as it’s so fast paced so it depends on how visible you are on it depends on how many you need to be tweeting, you need a consistent stream on all your platforms, I believe Instagram and Pinterest have their own scheduling tools built in, Whilst on that note, Facebook do have their own scheduling tool built in which is brilliant, so if you only use Facebook then that will be perfect. If something isn’t working, then take a 10 min break, go grab a bite to eat or a cuppa, don’t sit there stressing and letting it consume you, if it’s a task that seems to be beating you, then ask a friend or see if you can find an accountability buddy that you can bounce off, fresh eyes can sometimes help a fuzzy situation, just because you work at home for yourself, it doesn’t mean you have to be isolated and alone! Lastly, if things are just getting out of hand, and no matter what you are doing, you can’t get on top of your workload, then maybe it is time for you to look at outsourcing. Now this word often generates fear and anxiety amongst business owners, I can pretty much bet my shoes that you have a friend that has used someone in the past for outsourcing and it turned into an absolute nightmare. This doesn’t have to be the case, if you do your research, connect with people and join some relevant business groups, you will soon grab some tips on how to find someone suitable, or you could connect with me and I can either help you with your issues, or give you some guidance on finding someone that you wish to work with. Try and put these in practice, you owe it to yourself, your mind body and soul as well as your family to get a grip with your workload and working hours. Give them a go and let me know how you get on, change needs to happen, if it doesn’t you will just run yourself into utter exhaustion. Reasons Why Business Support Is Getting More Popular In The Past Decade. Copyright © 2019 Remote Admin Services. Powered by WordPress. Theme: Accelerate by ThemeGrill.